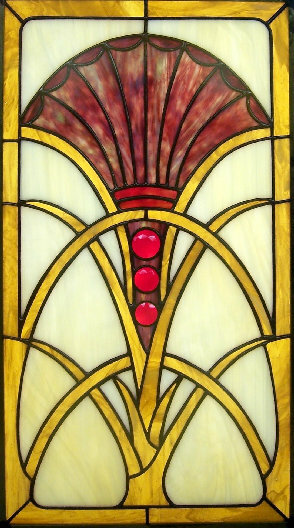 Laura's Palm is a stained glass window that is derived from Cleopatra's Palm, a design by Bill Hillman from his book Glass Design Sourcebook. While visiting for a few days, my daughter wanted a crash course in building stained glass and fell in love with this design. We modified the design a little, and after a day or two's hard work and some fun Daddy- Daughter time, our profect was complete. A friend gave me a 20 year old solid mahogany front door that he was replacing on his home. 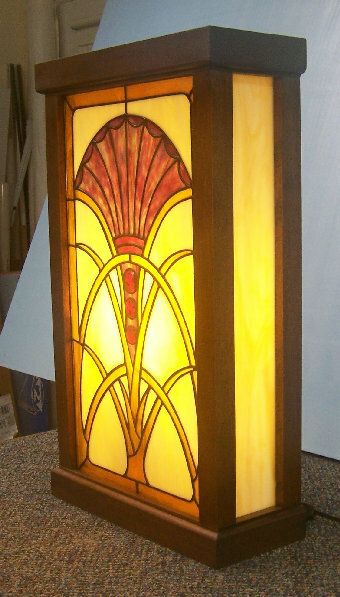 After a year of saving the wood for a special project, I decided to make a lamp to show off the Laura's Palm window that my daughter and I had built together. A few hours of cutting, sanding, staining and wiring produced the lamp above. 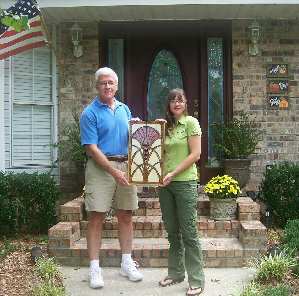 It was completed in March of 2009, just in time for my daughter's birthday.